Three little words that bring me back to my childhood: Jonathan Taylor Thomas. 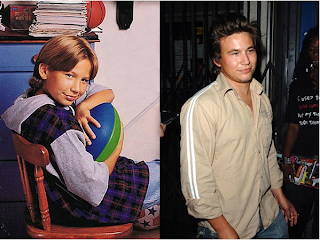 Aside from starring in my adolescent daydreams, JTT also made time to make other girls' hearts swoon as Tom Sawyer in Tom and Huck and as Randy on Home Improvement. Despite his busy schedule, I was willing to wait and accommodate my actor in shining armor. I'm still not sure what enthralled me so much about the only person I knew who actually used their middle name in regular conversation, but I was hooked. Flash forward to 2010 and the former man of my dreams is nowhere to be found. IMBD, the only site with stalking skills I trust, has no mention of JTT past 2006. The picture you see above is dated to 2005 - aka the last photographic evidence of JTT on the first five pages of Google. It's quite obvious that his star fell, but every once in a while his name still comes to me. Call it a childhood crush, but I'll always have a Hollywood hotspot for my three-lettered leading man.